shipstamps.co.uk • View topic - QUEST. Built as a wooden hulled seal catcher by the yard of Erik Linstøls Båtbyggeri at Risor, Norway for Andr. Ingebrigtsen, Høvik near Oslo. Powered by 2-cyl. steam engines of 17nhp. March 1921 sold to Sir Ernest Shackleton after he made a short visit to Norway, she was renamed QUEST. Shackleton would use the vessel for his expedition to the Antarctic, but she was not so suitable for the voyage, small and straight stemmed, with an awkward square rig on her mainmast. He engines were too weak, and her boilers found at sea cracked. In all ports of call she needed repairs. 17 September 1921 she sailed from the St Katharine’s Dock in London under command of Capt. Worsley. The QUEST made calls at Lisbon, Madeira, Cape Verde and Rio de Janeiro, at Rio de Janeiro Shackleton did have a heart attack, but when the ships doctor Macklin want to make an examination, he refused, but the doctor could see that he had a heart problem. After sailing from Rio de Janeiro bound for South Georgia, Shackleton mentally changed he seemed unnaturally listless, always the leader and full of ideas, now he had not any plans and it seemed that he had turned to the past. 04 January 1922 she arrived off South Georgia and anchored off the whaling station of Grytviken. Early in the morning of 5 January Dr. Macklin was called to Shackleton bunk and he found him with an other heart attack, not much he could do and a few minutes later Shackleton died. 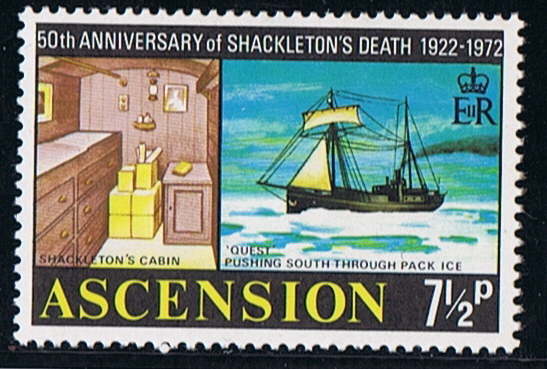 (On this expedition Shackleton was appointed an Agent of the Post Master General for this expedition, and provided with one hundred pounds worth of British postage stamps, a circular date stamp and a trio of rectangular hand-stamps of a size to fit over a pair of stamps, for three of the countries they were expected to visit; namely Tristan da Cunha, Cough Island and Enderby Land.) as given in Log Book 1983 Vol 13 page 311. After Shackleton death, his body was send back to England for burial, but when his wife Emily got the message of his death, she decided that her husband should be buried on South Georgia. After arrival of Shackleton’s body at Montevideo, it was send back to South Georgia. And there his body was laid to rest on 05 March 1922 in the Norwegian cemetery. After Shackleton died, the QUEST carried on, under Wild’s command, but he was not a leader and without Shackleton he was lost, he started drinking heavily; he had never done before on sea. Before the QUEST sailed home in June, Wild took her to Elephant Island. 16 September 1922 she arrived in Portsmouth. 1923 Sold to to W.G Oliffe, Cowes. March 1924 sold to Schjelderups Sælfangstrederi A/S ( Capt. Thomas Schjelderup), Skånland Bø (fishery No N-94-BN). In use as a seal catcher in the Arctic, and probably as fishing vessel in between catching seasons. 1929 Took part in the search for Amundsen and Major Gilbaud who disappeared in a hydroplane in the Arctic, while searching for General Nobile and the aircrew of the airship ITALIA. 1935 Chosen to transport the Anglo-Danish expedition of Lawrence Wager and Augustine Courtauld, to Greenland, a summer expedition based at Kangerlussuag, Greenland. The QUEST returned from Kangerlussuaq on 29 August 1935, she left 7 expedition members behind who were to continue work. 1936/37 Count Gaston Micard chartered the QUEST, under command of Capt. Ludolf Schelderup, for an expedition to East Greenland; the expedition overwintered at the mouth of Loch Fyne (74N). During the overwintering the crew of the QUEST caught 162 fox. End July 1937 the QUEST returned to Europe making calls at Scoresbysund and Ammassalik. January 1939 sold to Skips-A/S Quest (Ivar Austad, Tromsø) (fishery No T-24-T.
A 4-cyl 2tv Wichmann diesel engine was installed, 350 bhp. Still used as a seal catcher, and probably in regular fishing in between seasons. When war broke out in Norway in April 1940 she was catching seals near New Foundland, and she came under Notraship control. Upon hearing of the German invasion in Norway she proceeded to St John’s. November 1940 hired by the Royal Navy, as a minesweeper in the West Indies/Caribbean. July 1941 handed back to Notraship. March 1942 she was scheduled for convoy SC 76 from Halifax, but she did not sail. April 1942 requisitioned by Den Konglige Norske Marine (Royal Norwegian Navy). Intended for use in Operation “Fritham 2” at Spitsbergen, Svalbard in May that year, but this was cancelled. Then she shows up in convoy SC 83 which sails from Halifax in May 1942. September 1942 returned to Nortraship. 21 June 1943 hired by the Royal Navy as water carrier, till 1945. 10 October 1945 laid up. 19 July 1946 returned to owner. 05 May 1962 while catching seal off the north coast of Labrador, she sprang a leak and sank due to ice. The crew was rescued by the Norwegian seal catchers NORVARG, POLARFART, POLARSIRKEL and KVITFJELL. 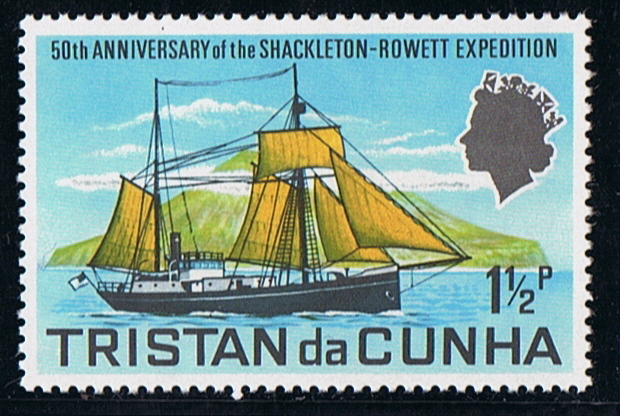 Tristan da Cunha 1971 1½p sg 149, scott 153. Source: Mostly copied from http://www.warsailors.com/freefleet/norfleetpq.html Shackleton by Roland Huntford. Ships of the Royal Navy Vol. II by Colledge. Log Book. Some other web-sites. The Quest was suffering from a bent and misaligned propshaft, which caused a lot of engine problems, hence the many stops en route. When Shackleton died, Len Hussey injected ether into his heart in a vain attempt to revive him. 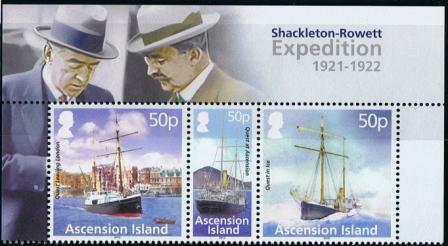 Shackleton-Rowett Expedition (1921-22) was the last to be led by Sir Ernest Shackleton. It was sponsored by Mr. John Quiller Rowett and ultimately was led by Captain [Commander] Frank Wild. The three were photographed in 1921 looking out from the bridge of the QUEST when they paid a visit to Southampton to supervise the fitting out of the ship prior to the expedition. 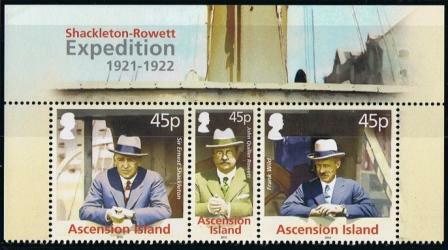 The 45p stamps are based on this photograph in an unusual Triptych format. The expedition proposed an ambitious two year programme of Antarctic exploration but before any work had begun Shackleton tragically died aboard ship on 5th January. 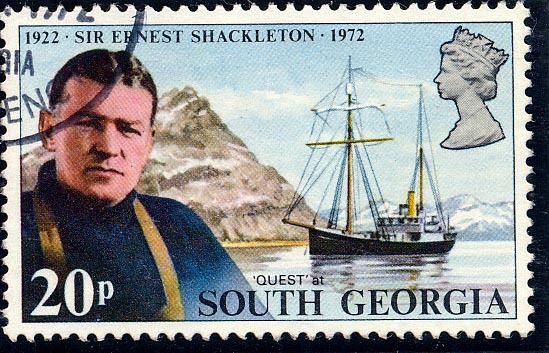 The QUEST had only just arrived at South Georgia and on 4th January anchored off Grytviken, where Shackleton went ashore to visit the old whaling establishment once again. Returning to QUEST he retired to his cabin to write what was to be the final entry in his diary. “It is a strange and curious place” he wrote. “A wonderful evening. In the darkening twilight I saw a lone star hover: gem like above the bay”. The expedition had numerous objectives including a circumnavigation of the Antarctic continent and the mapping of 2,000 miles of uncharted coastline, a search for wrongly charted sub-Antarctic islands and investigations into the possible mineral resources in these lands and an ambitious scientific research programme. It was unrealistic for so few men to achieve all of these objectives within two years. There was no single main goal other than perhaps Shackleton’s wish to return south once more. Shackleton himself referred to the expedition as pioneering. There was an aircraft (that ultimately was not used) and all manner of new gadgets including a heated crow’s nest and overalls for the lookouts, a wireless set, an odograph that could trace and chart the ship’s route automatically, a deep-sea sounding machine and a great deal of photographic equipment. Such gadgets were made possible by the sponsorship of the businessman John Quiller Rowett. Having made a fortune in the spirits industry Rowett had a desire to do more than simply make money. Following the First World War he was a notable contributor to several charitable causes. He was also a school-friend of Shackleton’s at Dulwich College and he undertook to cover the entire costs of the expedition. According to Wild, without Rowett’s generosity the expedition would have been impossible: “His generous attitude is the more remarkable in that he knew there was no prospect of financial return, and what he did was in the interest of scientific research and from friendship with Shackleton.” His only recognition was the attachment of his name to the title of the expedition. Sadly in 1924, aged 50, Rowett took his own life believing his business fortunes to be in decline. After the death of Shackleton, Frank Wild took over as expedition leader and chose to proceed in accordance with Shackleton’s plans. 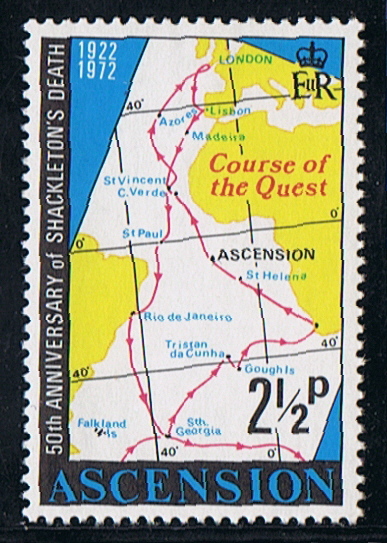 The QUEST, shown on the 50p stamps leaving London, at Ascension and in Ice, was the smallest ship to ever attempt to penetrate the Antarctic ice and despite several attempts the most southerly latitude attained was 69°17′s. The ship returned to South Georgia at the onset of winter. QUEST remained in South Georgia for a month, during which time Shackleton’s old comrades erected a memorial cairn to their former leader, on a headland overlooking the entrance to Grytviken harbour. QUEST finally sailed for South Africa on 8th May where the crew enjoyed the hospitality of the Prime Minister, Jan Smuts, and many local organizations. They also met Rowett’s agent with a message that they should return to England rather than continuing for a second year. Their final visits were to St Helena, Ascension Island and St Vincent. In the end the expedition achieved little of real significance. The lack of a clearly defined objective combined with the failure to call at Cape Town on the way south to collect important equipment (including parts for the aeroplane) added to the serious blow of Shackleton’s death, which ultimately overshadowed the expedition’s achievements. The expedition has been referred to as the final expedition of the heroic age of Antarctic exploration. Those that followed were of a different nature and belonged to the mechanical age. Ascension Island 2012 45p/50p sg?, scott? Alexander Macklin was born in India in 1889, the son of a Doctor and he was of course to follow in his father’s footsteps. Soon after qualifying he applied to join Shackleton’s Imperial Transantarctic Expedition and was accepted as one of two doctors. As well as his surgeon’s duties he was put in charge of the ship’s dogs and was also assigned a team of sledge dogs to drive. The skills of the two surgeons were put to the test with a range of ailments including Gangrene, Heart Problems and at least one Nervous Breakdown as well as the more mundane problems that would affect all of those living in difficult circumstances in freezing weather on Elephant Island for so long. On return to England, Macklin joined the army as an officer in the Medical Corps serving in France and Russia during the First World War. He won the Military Cross (M.C.) for bravery in tending the wounded under fire and later joined Shackleton in Russia in the fight against the Bolsheviks. Shackleton invited Macklin to join him again for the Quest expedition in 1922 as the ship’s surgeon together with a number of fellow crewmen from the earlier expedition. 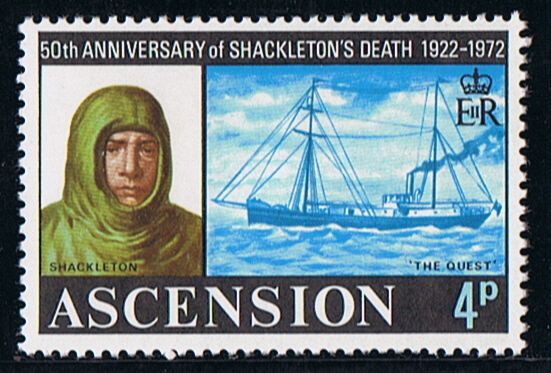 On Shackleton’s death at South Georgia, it fell to Macklin to prepare the body for transport to South America and then for burial on South Georgia. 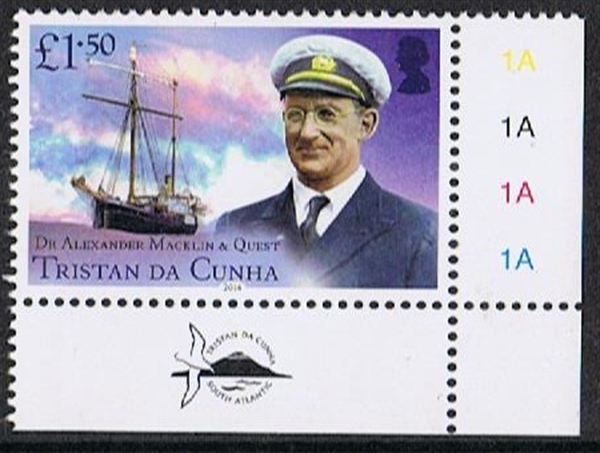 Although some members of the crew left the Quest following the death of Shackleton, the bulk of the crew took the vessel back to the UK and on the morning of 19th May 1922, the Quest was spotted off the coast of Tristan da Cunha. Many of the crew visited Edinburgh of the Seven Seas and Dr Macklin stayed in the cottage of Bob Glass although he was later to record that he had a problem with a “small army of marauders” which kept him awake. Macklin, who was in charge of stores arranged to leave a large amount of stores behind prior to the departure of the Quest six days later. In 1926 Macklin established a medical practice in Dundee, Scotland where he would work for the next 21 years. During World War II, he served in the Medical Corps in East Africa as a Lieutenant Colonel and died on 21 March1967. Tristan da Cunha 2014 £1.50 sg?, scott?